Environmentally friendly consumers are trading out red meat, which is notoriously high in greenhouse gas emissions, for chicken and fish. They should think twice. Giving up meat can be a difficult feat. Many people try avoiding red meat first as a way to reduce their environmental footprint or reap some of the benefits of a plant-based diet. While this can be an excellent first step, those swapping out red meat for chicken and fish should recognize that, for the animals, it’s more harmful than helpful. 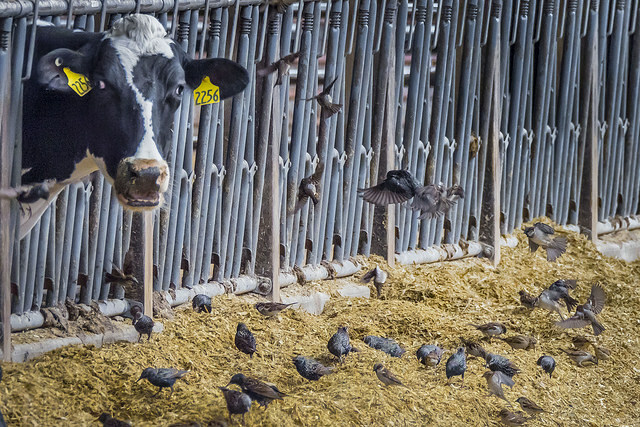 Work by social scientist Brian Tomasik suggests that chicken and fish suffer far more than equine animals, like cattle, because there are no federal laws protecting them at the time of slaughter. Tomasik compares the average suffering of animals mathematically by estimating and comparing their ability to suffer, living conditions, and pain they experience at death. He explains that fish suffer almost twice as much as cows do every day of their lives, while chickens endure triple the amount of suffering as cows due to cramped, painful conditions. To make matters even more complicated, no type of meat exists that is best for solving all problems. And this is where many people get stuck: they focus on the environmental concerns of eating meat while forgetting how their decisions impact the animals themselves. Beef is the least environmentally friendly choice. According to a November 2015 article in Meat Science, beef production is more harmful to the environment than other animal industries in several ways. Beef production uses more water, uses more land, and produces more greenhouse gas emissions than other animal production industries. But raising, killing, and eating fewer cows, without decreasing one’s meat consumption overall, produces incredible harm to animals. A fully or even mostly plant-based diet is best for both the earth and the animals. Dr. Dana Hunnes, a Dietician and Adjunct Assistant Professor at UCLA Fielding School of Public Health, explains that a plant-based diet reduces pollution, waste by-products affecting the ocean, and fresh water usage and saves habitats from being destroyed for livestock feed. Making an effort to consume less meat overall can be a helpful place to start because it does not require balancing the importance of the environment against the importance of animal welfare. An excellent way to make a difference is to try to incorporate weekly meals that are meat-free. Cities like Berkeley, California have encouraged citizens to eat vegetarian once a week — à la meatless Monday — to help both the environment and animals. In the United States, people who self-identify as vegetarian or vegan represent a sizable 8% of the population, according to recent a Gallup Poll. Clearly, anyone wanting to adopt a more plant-based diet can do so and will not be alone. Eating less meat on the road to giving it up altogether and going vegan is becoming more convenient and feasible. Consumers are also being steered towards plant-based diets by systemic changes in the public and private sectors. Schools have long encouraged plant-based diets for public health and environmental sustainability, and New York City’s largest hospital system recently expanded its plant-based options. Individual consumers can affect change by buying plant-based options and joining with other voices to push for more options at their favorite restaurants and grocery stores. Learning about the realities of factory farming helps us make better-informed food choices. We have an obligation to do what is best for everyone—humans and nonhuman animals alike. And giving up red meat alone just isn’t enough.